The burning heat, the chilling cold, feels like heaven but also smells like hell. All I had from this here album by the Finnish band JUDAS AVENGER was loads of contradictions. To be frank, I was quite happy about it. What appeared to be like yet another cliché in the wind of Metal, turned out to be unanticipated and filled with surprises. 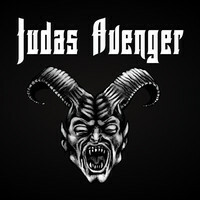 "Judas Avenger" is on a strict road to be one of the finest releases of a newcomer Metal band that I heard in a while. Just spawned out of their shells last year and already we have to be ready, there is a new monster on the loose. I can go on and on with another edition of comparisons to the old vanity of British Metal, and still it won't accurately describe the band's musical efforts. Whether it is IRON MAIDEN with Paul Di'Anno guesting MANOWAR's Eric Adams or ex-JUDAS PRIEST's Tim "Ripper" Owens, for a never to happen duet or the early scratches of nostalgic Black Metal that might astound of MERCYFUL FATE, I believe that JUDAS AVENGER has a tad more than that in their bullet belt. First of all, there is a clear diversity of melodies is impressive, assorted rhythm section that at one time would sound as traditional as one can get and at the other will turn its form into a picture of modernity. Furthermore, the band's vocalist is a true wizard, swinging from gnarls into smitten melodic voice, resulting in a true powerful front force mixed with the bands crushing musical mastery. "Judas Avenger" is not advanced when it comes to songwriting, yet it is not primitive either. It has unexpected moments which one might not take note of in traditional Metal. In addition, it landed a few marks to bear witness to such as the in your face "Hell Nation" and the melodic seducer, "Empire of Dust". In a nutshell, this is a journey through Metal's old tradition but with a few signals to its nowadays merits including a blink towards the extreme, mostly if you would judge by the closing track "Divine Darkness". With an add-on of mystery, JUDAS AVENGER bewitched me with their aura and I would really like to experience their Metal vengeance and conviction once again.